For the past few months, I have featured photographs on this site volunteered by Attila, New York based student of Philippine affairs, and a sharp, handsome European married to a beautiful and intelligent Filipina. 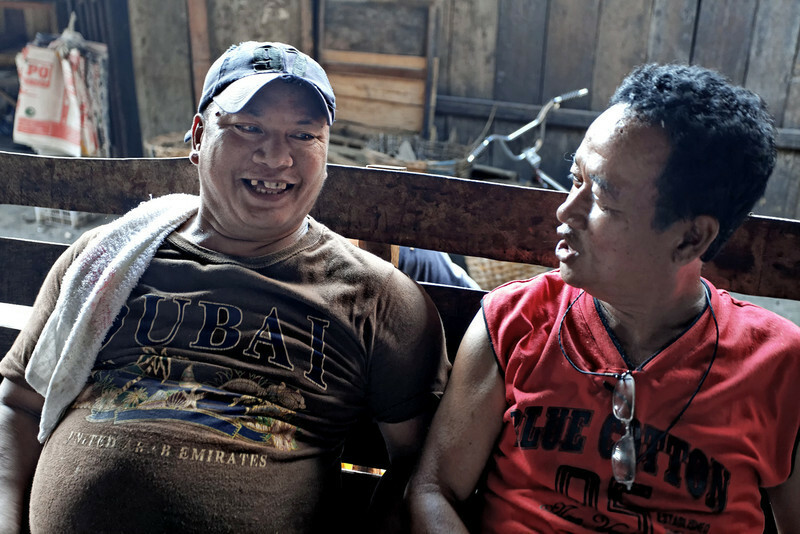 Attila has been a member of this elite Society for some time now, regularly popping in to share a perspective on the Philippines as seen from his own eyes or as expressed by his very observant wife. Attila asks no recognition or credits when I publish one of his photographs. This is unusual in this era in which it seems that everyone tries to own everything and sell rights to it to get rich or famous quick and easy. I find his photographs absolutely striking for color, composition, subject material, perspective and emotional clout. He puts up that famous 1,000 words a photo is worth every time he hits the “publish” button on his web site. More than that, he captures why those of us who have moved here find the Philippines to be a place of great visual riches and human passion, qualities that are very difficult to put into words. You will see more of Attila’s work as we have occasion to put the spotlight on it. When a foreigner appreciates the Phil this much, then it’s a shame some Filipinos don’t. P. S. Joe, election’s over. You are free to comment now on all that’s happened and your prognoses. I am sad Jun Magsaysay/Hontiveros wont make it, but delirious that Jack Enrile, Mitos Magsaysay and Zubiri didn’t either. Get JPE out of the Senate presidency! I swear you have a spy-cam in my home. I am busy typing my reactions to the election, for insertion in the crowded line-up of blogs for this week. One of the lines says this: Disappointments: J. Magsaysay, R. Hontiveros, N. Binay. The Philippine electorate is proving to be capable of a certain level of discernment. Confidence upward bound . . .
1. All the 7 photos are striking. I like the bracketing, the pairing of the banner photo of two innocent happy girls with the closing photo of two middle-aged men. The chubby girl at the beginning on the right mirrors the chubby man at the end on the left. 2. Four are people photos, three are scenic. Of the four, all are pairs: girl and friend, man and fish, girl with toddler, and fat man with thin man; I would say the themes are friendship, food, family and camaraderie. Of the three, two are seascapes and one cityscape; the themes are tranquility, beauty and memory. 3. Photo 1: The Girl with the Pearl Earrings. The things that strike me are: (a) the background of thatch and woven palm tree leaves; (b) the the smiling eyes and white teeth; (c) the contrasting hairstyles; (d) the protective, embracing arm of friendship. 4. 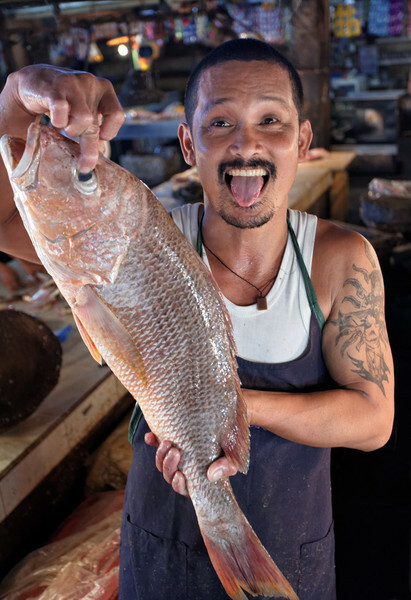 Photo 2: The Man with a Red Snapper. (a) The wet market background; (b) the tongue bracketed with upper white teeth and black mustachio and beard; (c) the religious tattoo of a flaming cross coupled with the amulet necklace; (d) the soiled purple apron with green straps; (e) the imposing descaled fish. 5. Photo 3: The Dilapidated Mansion. (a) The symmetry of an old (turn-of-the-century? Pre-war? Post war?) once-majestic mansion; (b) the sagging double roof and the awnings; (c) the wooden walls that have turned gray; (d) the rotting foundation on the right corner; (e) the two-columned grand entrance. The family (?) has fallen on hard times and have opened a sari-sari store or carinderia on the front left. 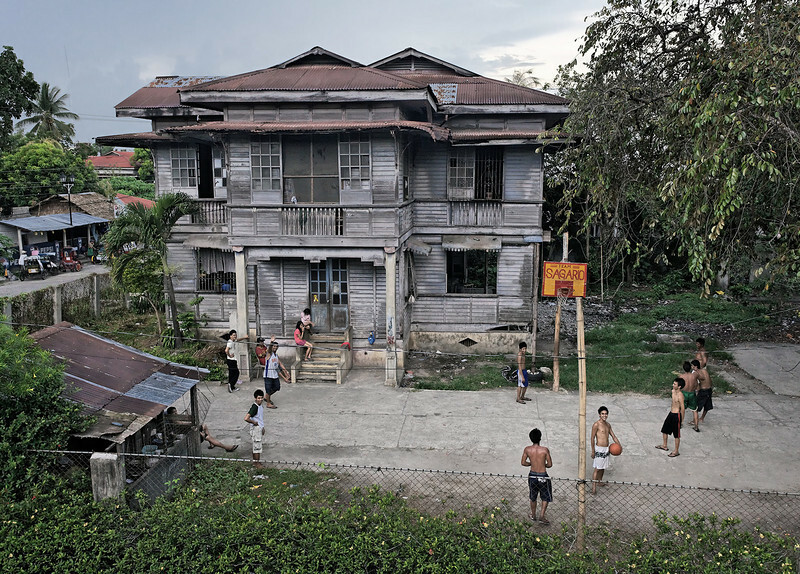 This is my second favourite because it’s symbolic of the Philippines: people playing before a neglected beauty. 6. Photo 4: Man Poling a Boat. (a)The composition and subdued coloring of sea, earth and sky; (b) the sharp triangle formed by man-boat, pole and sea is echoed in the equilateral triangles of the island-mountains and broken by the fluffy cumulus on the left and the cumulo-nimbus on the right; (c) the thrust of the silver-gray prow points to the shimmering glints of sunlight on the water and, from there, to the silver-gray clouds. 7. Photo 5: Elder Sister with Belligerent Toddler. This is a study in contrasts: (a) She smiling, he not; (b) she with full straight hair, he not; (c) she fully clothed, he not; (d) she skinny, he not. 8. 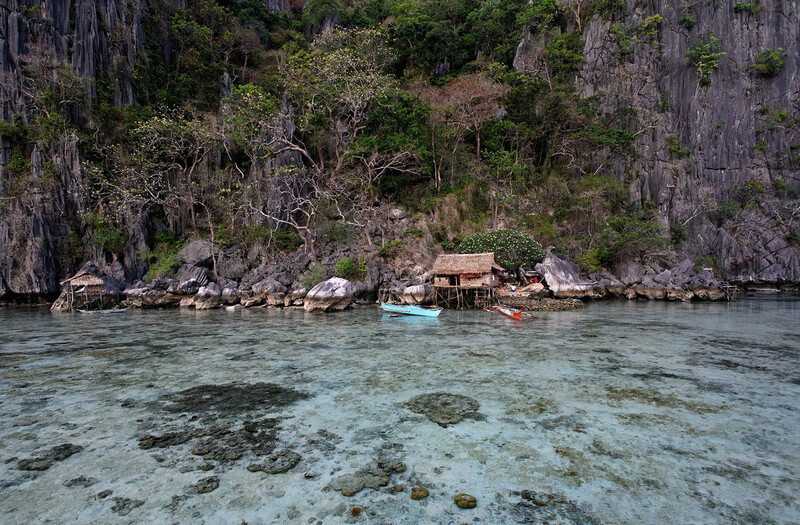 Photo 6: Nipa Huts on Stilts before Forbidding Cliffs. Reminds me of man’s conquest of a beautiful but hostile environment. Access is only by water. The boulders, shaded with high-tide marks, are as big as the huts. The backdrop of rock wall, bare branches and greenery form a random tapestry. Note the bush with white flowers just behind and to the right of the dominant hut. I wouldn’t mind a seawater lawn. 9. Photo 7: Roly-poly With Sinewy. Another study in contrast: (a) gap-toothed, three-chinned, beer-bellied, be-towelled roly-poly OFW with a mole, denim cap and ear studs vs. single-chinned, freckled, cap-less, earring-less, sleeveless, no-belly companion with hanging spectacles; (b) an open expression of uninhibited glee with open eyelids vs. one of reasoning skepticism with half-closed lids and argumentative lips; (c) the background details of strong horizontal bench slats, two woven baskets, a bike and paper sheets or cloth bags used to wrap or contain merchandise. The comfortable roundness of the belly makes this picture. Somehow this unposed photo is my favourite because these two seem to be so quintessentially Filipino. I have seen those blackened teeth and tooth gaps on a hundred smokers and that towel on a hundred jeepney drivers and street sweepers. Ah, my, the engineer at work, eh, ever measuring. I rather went with the emotional impact, or the sum of the impressions, and perhaps can back into why the impact was so strong for me. Two girls, one dark, one light, one thin one not, representing the ethnic history, mix and beauty of the Philippines, the sum of which is a very sincere, innocent, personable honesty. Undemanding. The house, symbolic of the old people of the Philippines who bore so much pain, of war and kids and at one time an elegant lifestyle. And the ever-playing young men, who’ll find fun anywhere. 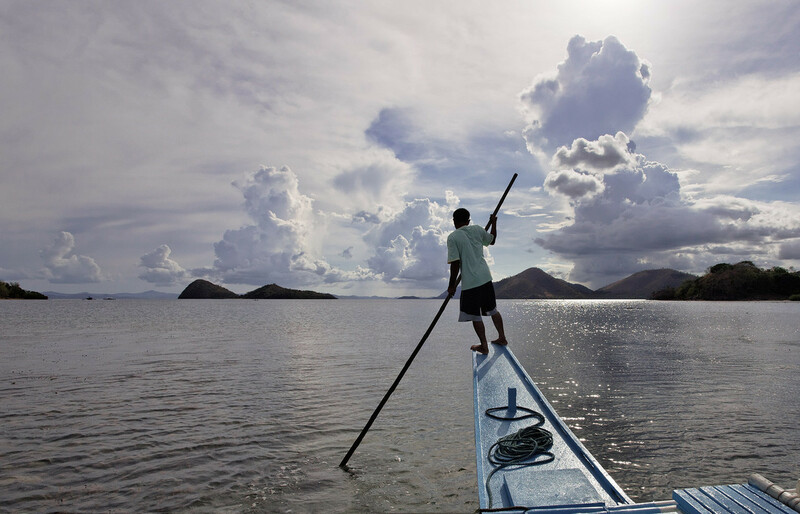 The man poling the boat, a solitary figure heading into the grand expanse of the Philippine seas, where sirens beckon and trepidation lingers in the darkening evening clouds. The girl with the baby. This one is the most complex for me. A beautiful girl holding a wrinkled (crabby?) baby. What future for these innocents? The house at the bottom of the cliff: isolation,risk and immense satisfaction for having a very unique spot on this earth. Do they flee the storms, do you think? I imagine their seas are not over-fished. In another photo we can see their laundry hung out to dry. I’d like to spend some time there. The rest of this crazy world would be gone. The two men. Yes, it is last because it is best, capturing the camaraderie of guys who have “been there, done that”, and enjoy spinning some stories over the tuba or beer. There is a genuineness to this one to match the two girls at the beginning. Attila also has many magnificent seascapes, but these people shots are power-packed. We read many things into sometimes fleeting juxtapositions. This is good training for becoming ’empaths’, reading auras. Not that I want to see too much. As it is, I have difficulty reading myself and I consider myself an open book because I am seldom, if ever, motivated by malice. Or so I hope. But the intellect – especially when looking at the Philippines and the Church — cannot help but be tainted with darkness. I have no words, they all speak straight to my heart and I love what they are saying. Looking forward for the book edition!!! Thank you all for your kind words. 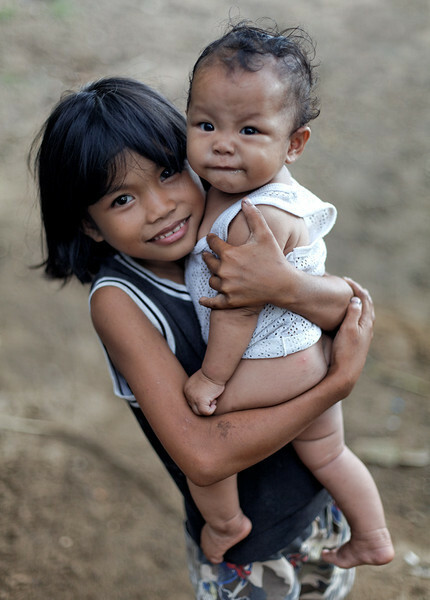 It is my passion to photograph the Philippines. To me the Philippines is the most photogenic place on Earth. It has a rich subject material for all kind of photography: Landscape, street, portrait, documentary and more. Now about that book that Josephivo mentions . . . .